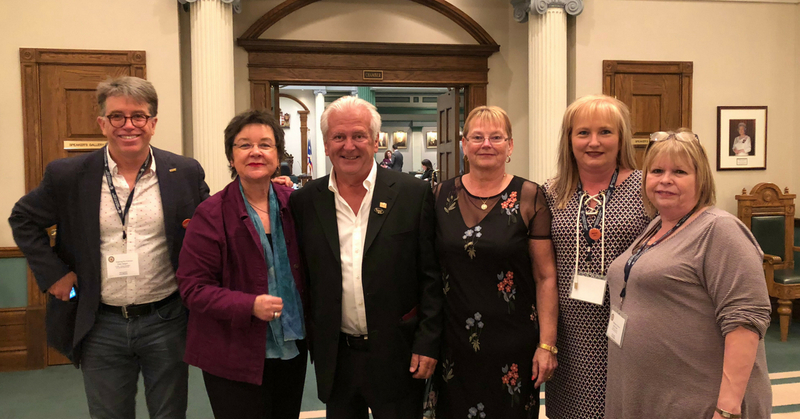 Surrounded by colleagues and family, recently retired CUPE Newfoundland and Labrador president Wayne Lucas, was celebrated in the House of Assembly in St. John’s yesterday. NL NDP Leader Gerry Rogers delivered a powerful address, speaking to Lucas’ dedication throughout his distinguished career. Lucas was a CUPE member for 40 years, starting as a school board worker in 1978. Prior to his recent retirement, Wayne served as President of CUPE Newfoundland and Labrador for the past 26 years. “Throughout his leadership he worked for the rights of our working people, work also benefitting the general population. He championed issues such as affordable childcare, a fair minimum wage, secure pensions, support for women victims of violence, LGBTQ2S rights, and so much more,” said Rogers as she delivered her address in the House of Assembly. As Rogers concluded, she asked all of the members to join her in thanking Lucas for his years of excellent service to the people of Newfoundland and Labrador. This was met with a warm round of applause.